Spring is when Amish communities generally share communion together (also in the fall), and they do this outside of their regular church services. After communion, they wash one another’s feet in a sweet gesture of servitude, humility and kindness. For those of us who are not quite Amish, we can take delight during this lovely season in serving people outside our church and remembering all Christ has done for us. If you’ve been feeling conflicted and convicted about Christ’s #2 command to love your neighbor—guilty, even—spring is just the opportunity you’ve been looking for. Springtime calls us outside to greet our neighbors after a long winter’s nap! Here are some new ideas for you and Sandy that just “may” open the door to a new neighborly friendship! 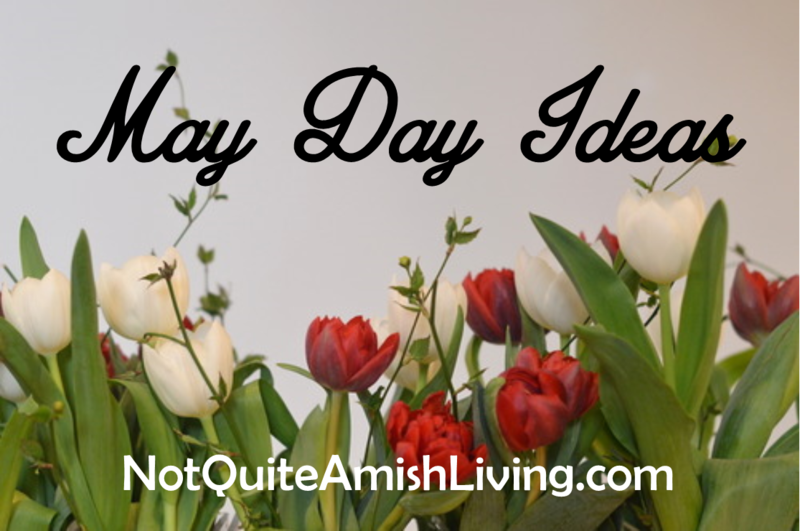 May Day is typically celebrated by hanging a basket of flowers or sweets on your neighbor’s door, usually anonymously. If you’re caught leaving a May Basket, tradition says you have to exchange a kiss! The basket: Get creative with your container! Small wicker baskets are inexpensive and can be found in abundance at thrift shops and flea markets. If its handle doesn’t allow the basket to hang from a doorknob, simply snip it off and tie on a ribbon hanger. Remove the label from a tin can. Use a hammer and nail to punch holes in the sides to hold a ribbon hanger, or make a handle out of wire. Here’s how. Patterned scrapbook paper or solid construction paper can be rolled into a cone and stapled or taped shut to form a container. Make a basket by cutting a paper plate in half. Glue half the plate to a full paper plate, right sides together, to form a pocket. Wildflowers or blooms from your yard are lovely. Purchase a bouquet from your florist or greenhouse and divide the flowers into several smaller May Bouquets. Draw flowers on small paper plates or coffee filters and attach a stem made out of a popsicle stick or pipe cleaner. Check out these simple flower crafts kids can make. Artificial stems last forever and are very affordable. Sweet treats: Tuck a surprise inside! May Day Baskets can also hold wrapped hard candies or lollipops. Wrap a couple of your favorite store-bought or homemade cookies in plastic wrap to keep them fresh. Write a sweet note or Scripture for your neighbor wishing them a happy spring. Sunshine and blue skies are the perfect time to plan a neighborhood get together. Invite a neighbor or two to celebrate May Day with a picnic in your yard or at a local park. Sip May Punch—traditionally made with wine, herbs and fruit, you can make a “mocktail” version with white grape juice, seltzer water, basil and strawberries. Serve flower shaped cookies and fruit for light, springy snack. Contact a local nursing home and ask if you can deliver May Day baskets to residents. Ask their advice before using fresh flowers or food products. Ask if there are any residents in particular who would be cheered by a special visit. Deliver a care package of hand sanitizer, tissues, lozenges, a notepad and pen to people waiting in the Emergency Room. Drop off a basket to your nearest police or fire station with a note of thanks and a prayer for safety. With permission and planning, take May Day Baskets to the local jail or recovery center. @NghborhoodCafe shares 3 May Day ideas to get to know your neighbor! What lovely ideas. I love the nursing home idea. Thanks! Amy, you are an inspiration, a breath of fresh air! Сегодня нет рамок приличия и ограничений в сексе.